A simple, harmless comb at first sight, this covert piece transforms into a useful knife measuring almost 7 inches in length. The blade is 3.5 inches and features partial-serration for any task. Cleverly disguised as a hair care product, this sleek 3.5-inch comb knife might be the perfect solution for you when you're on the go. The narrow steel blade is concealed inside a 6.5-inch comb, and no one will know you are carrying a knife unless you tell them you are. Because it is small enough to slip into your purse or jacket pocket, you can bring it virtually anywhere undetected. 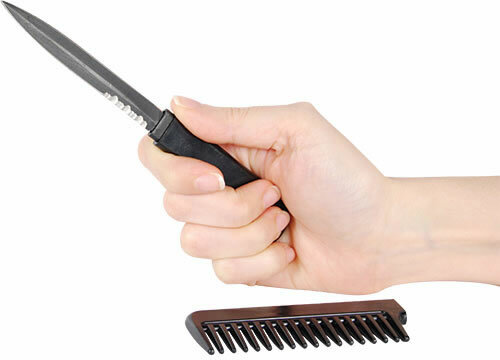 For those that want a discreet, yet functional defensive tool, then the Comb Knife is the answer! Keep your locks well groomed and have a blade hidden and ready for use at the same time! Become the top-secret agent you always wanted to be with this novelty item. If you haven't gotten a comb knife yet, you need to get familiar. These are the hottest gifts around. Get black for a guy to use as a cool conversation piece. 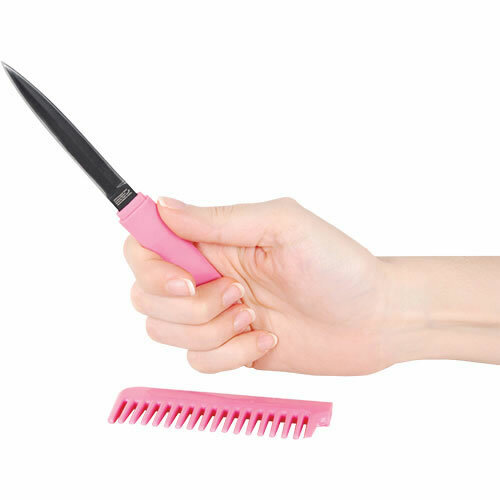 Or get the pink comb knife for the girl that has everything. A simple, harmless comb at first sight, this covert piece transforms into a useful knife measuring almost 7 inches in length. The blade is 3.5 inches and features partial-serration for any task. It is also the perfect product to buy for beginners or anyone who is not familiar with knives. Notice: We are unable to ship Comb Knives to: California, Massachusetts or New York. Ideal for stabbing and slicing in close-quarters combat, this comb knife is versatile enough to be used as a seatbelt cutter during an emergency. Featuring a sharp edge and an ergonomically shaped handle, as well as an actual comb on the end, this spear-point knife is sharp on both sides. 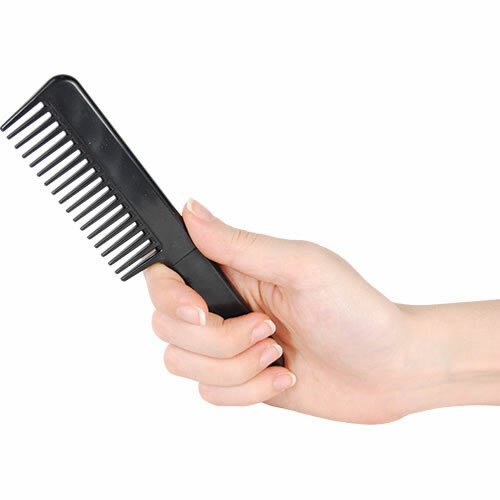 The comb end snaps into place to keep it safe while it's not in use, but it does come off with minimal force. It's an economical and stealthy alternative to a traditional fixed blade knife. This item is being sold to you as a collectible. Please check your local laws for any regulations that prohibit ownership of knives of this design. To purchase a one, you must be at least 18-Years old. 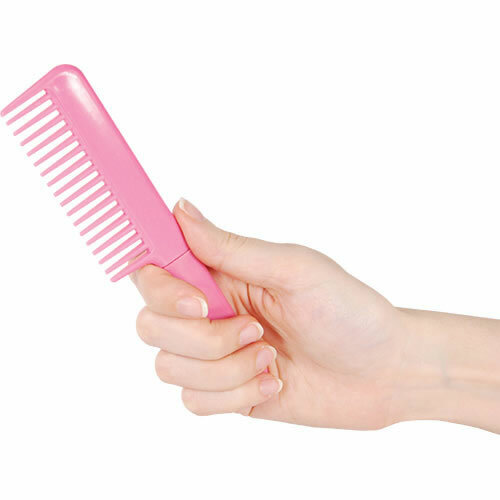 Easily fits in a pocket or purse, it functions exactly as a sturdy comb, and the knife is not noticeable at all, until it is unsheathed. It comes in black, too. I ordered the pink one for myself, then when my husband saw it, he wanted one, too.